Happy Monday! 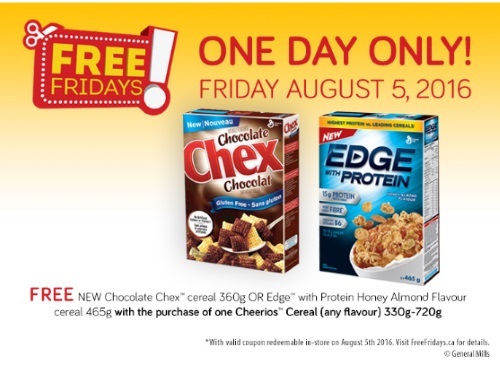 There is a new Free Friday coupon available, this time on Chocolate Chex & Edge with Protein cereal! Get a Free New Chocolate Chex cereal 360g OR Edge with Protein Honey Almond Flavour cereal 465g with the purchase of one Cheerios Cereal (any flavour) 330g-720g. This coupon is valid only on Friday, August 5, 2016. Please note you can also get this coupon from the Walmart coupon portal here if you want a second one.